Is the 10 inch Slant Six "Heavy Duty" Taxi unit good for a car that will see some drag strip passes? I had a stock pressure plate explode many years ago. It destroyed the engine block ,bellhousing, transmission nose, as well as putting a nice window up through the hood and right beside my foot. Luckily I wasn't hurt but that event has always stuck in my mind. Now twenty years later, my son and I are putting together a slant six car that he will be running a 4-Speed. I know most of the racers use an automatic transmission, but some racers are currently, or have used, a 4 or 5-speed. What clutch are they using? 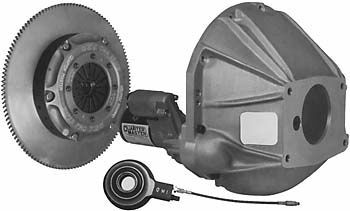 What type of clutch/pressure plate did Seymour run for all the years he ran a 4-speed? Anyone ever try to use an automatic transmission blanket around the bellhousing area for some protection? I have also had a clutch "blow apart" and really make a mess out of the car. I also felt extremely lucky I was not hurt. The engine block, cast iron bell housing, all the clutch parts, flywheel, transmission case, drive shaft and rear end knuckle (yoke) were turned into "scrap iron" in an instant. When I fixed the car it was changed over to an automatic trans and I never raced a "clutch / shift car" from that point forward. a strong set-up that could handle some race track use and abuse. with the passenger car SL6 cast iron flywheel size setting the limits. The flywheel has a 122 tooth ring gear and measures 11 1/4 at the ring gear base. The pressure plate attaches with six, 5/16 - 18 unc bolts, drilled on a 10 5/8 bolt circle. There is an 11 inch clutch SL6 Truck cast iron 143 tooth flywheel but these use a large multi-bolt pattern cast iron bell housing with the low V8 starter position. The 11 inch truck clutch weighs a lot and it is hard to get into a passenger car so it is not a good option. 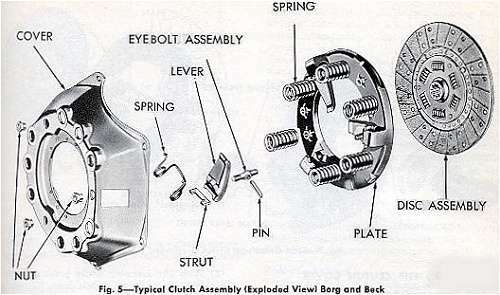 One of the more common SL6 passenger car clutch set-up is the 9 1/8 Borg & Beck assembly. It uses a pressure plate with a full cover and 6 bolt tabs extending outward from the edge, like a brim on a hat. The assembly has 3 levers at the center and are strong units but in stock form, they lack good spring pressure. (most are loaded with 6 springs) These units can be rebuilt using heavy duty hardware and more springs (9 total) giving you more spring pressure. The pressure plate's small size and lack of assist weights allows it to spin high RPMs and still disengage for the shift. The problem has been getting enough spring pressure built into them so they grip at the starting line when "dumped". There were some 9 1/4 and 9 1/2 Auburn pressure plates used which have a lever "carriage" rather then a full cover. These units have 3 levers and provisions for only 3 springs, making higher spring pressures difficult to achieve. What really worries me about these units is that many versions mount with only 3 (three) 5 / 16 - 18 unc bolts. I would not trust one of theses pressure plates. The heavy duty pressure plate and disc for the SL6 is a 10 inch size "cover type" Borg & Beck, 3 lever unit. These units adds some needed surface area while still bolting to the stock 122 tooth flywheel. This is a special cover with it's six mounting bolt tabs which are inset into the cover. Here again, these pressure plates have lots of room for additional and /or stiffer springs but the inset tabs are a weak point where cracks start forming as spring pressures go up. This pressure plate is Borg and Beck # 1576 and be sure to inspect the tab areas closely if you use one. These units mount to the flywheel with special reduced hex size cover bolts. That is about it as far as what will "bolt right up" to the stock SL6 flywheel without any special work. Thankfully there are a few after market clutch covers that will bolt to the "smallish" SL6 flywheel. 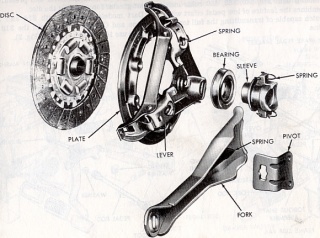 Most of these "aftermarket" clutches use a large diaphragm spring as it's levers and to provide spring pressure. These units work well at high RPM simply because there are fewer parts and therefore less weight. The overall holding force is a bit less then what can be achieved with the Borg & Beck units and I have seen some clearance issues when some of these have been used. 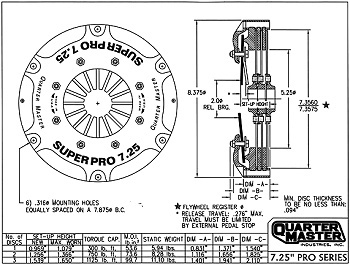 The diaphragm type pressure plate is also used to build multi disc clutch set-ups. The bottom line is that if you want to do some serious racing with a manual shift SL6 car then you need to look at some better clutch options. The good news is that there are a bunch of companies offering some nice stuff these days, Call around and talk to them about your needs. You will need to tell them the size of your flywheel and the transmission input shaft spline count. For reference, the small Mopar 9" -10" clutch flywheel (SL6 & small V8) has 122 teeth, the 10" - 11" (10.95") has 130 teeth and the 11" and up has 143 teeth. The street 833 4-speed has a 23 spline input shaft.